"Never Give Up" memorial sculpture of COMAC unveiled__Commercial Aircraft Corporation of China, Ltd.
Site of the unveiling ceremony. 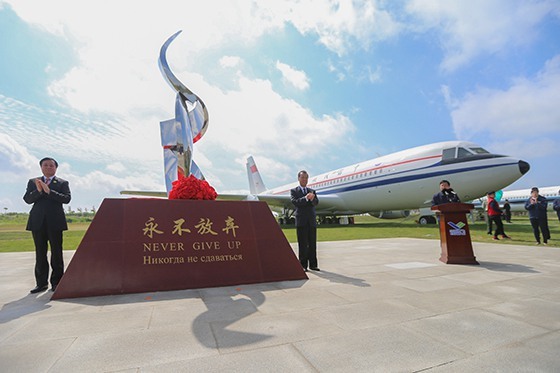 Commercial Aircraft Corporation of China, Ltd. (COMAC) unveiled the "Never Give Up" memorial sculpture in Pudong base of Assembly Manufacturing Center on May 11th, 2018 as part of the "Glorious Ten Years and Pursuing Dream in the Blue Sky" thematic activity to further keep the faith, carry forward the spirits of servicing the nation with aviation, "Four Long-Terms" and "never give up", and inspire cadres and workers to struggle ahead for the trunk liner career of China. Mr. He Dongfeng, Chairman and Secretary of the Party Committee of COMAC, and Mr. Zhao Yuerang, President of COMAC, jointly unveiled the sculpture, and Mr. Liu Linzong, Mr. Wu Guanghui, Mr. Zhao Jiufang, Mr. Guo Bozhi, Mr. Cheng Fubo, Mr. Zhou Xinmin and Mr. Zhou Qimin, members of Party Committee of COMAC, attended the unveiling ceremony. Mr. He Dongfeng expressed that COMAC had entered a new era of trunk liner career after ten years of hard pioneering work under the leadership of the CPC Central Committee with Comrade Xi Jinping as the core, with great support from central state organs, local governments and cooperative partners, and in the spirit of "never give up". He emphasized that in the new era, all cadres and workers should promote the trunk liner career of China in a spirit of "never give up", bear in mind President Xi Jinping's exhortations, seize the rare historical opportunity, set high aims, have lofty aspiration, never flinch in the face of difficulties, make unceasing efforts and seize every minute along the path of predecessors, and carry the trunk liner career on the shoulders. COMAC should thoroughly promote independent innovation, uphold the strategy of driving development by innovation, have a firm grasp of key core technology and key core competence, and build the self-owned commercial aircraft brand in a spirit of "never give up". COMAC should also advance opening up and cooperation, master the advanced methods, cultivate talents, improve self capacity, fully exert the leading role of civil aircraft industry, strengthen the cooperation with various fields, build the civil aircraft industry life community, focus on customers and create value for customers in a spirit of "never give up". The cadres and workers should rally more closely around the Party Central Committee with Comrade Xi Jinping as its core, stay true to the mission, remember the mission, forge ahead in a spirit of "never give up", and make contribution to realizing the objectives of "Three Ones", "Two Builds" and "Four World Classes" and building modern powerful socialist country at an early time. 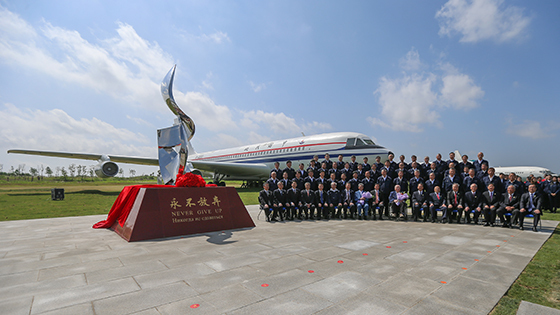 Mr. Cai Jun, Pilot in Command of C919 First Flight Crew, and Mr. Wu Xin, Second in Command of C919 First Flight Crew, presented flowers to Mr. Wang Jinda, Pilot in Command of Y10 First Flight Crew, and Mr. Zhang Yaode, Second in Command of Y10 First Flight Crew during the ceremony. After that, representatives of new employees, who represent the fresh blood of the trunk liner career of China, made a vow in front of the solemn sculpture: "Be loyal to the motherland, be loyal to the trunk liner career, uphold the spirits of 'Serving the Nation with Aviation', 'Four Long-Terms' and 'Never Give Up', adhere to the safety concept of 'life supreme and safety first', implement ten iron laws of quality, carry forward the craftsmanship culture, be consistent, persevering, steadfast and realistic, and struggle to realize the objectives of 'Three Ones', and 'Four World Classes." COMAC set this sculpture nine years ago in front of the Y-10 aircraft at Dachang, inscribed the base with the words "Never Give Up", and recorded the story about the development of the Y-10 aircraft as the firm faith and valuable spiritual wealth of people dedicated to trunk liner. The Y-10 aircraft was moved from Dachang to Pudong in 2017, and this sculpture was moved to Pudong along with the Y-10 aircraft. The people dedicated to trunk liner unveiled the sculpture once again with admiration to pass on the same spirit. The story of the Y-10 aircraft and the spirit of "never give up" inspire all the people dedicated to China's civil aircraft industry to forge ahead. More than 500 persons, including leaders of departments of COMAC and subordinate units and old comrades who have participated in the development of the Y-10 aircraft, attended the unveiling ceremony. A group photo taken on May 11th, 2018.